Always looking for a new challenge Darren like to incorporate new ideas. 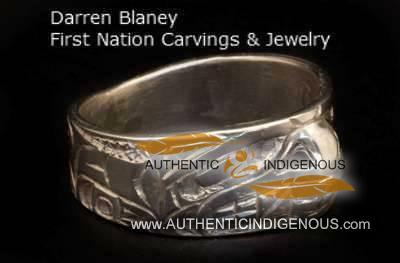 Darren Blaney is a First Nations Artist, currently living in Campbell River BC. Darren is always working on various pieces. 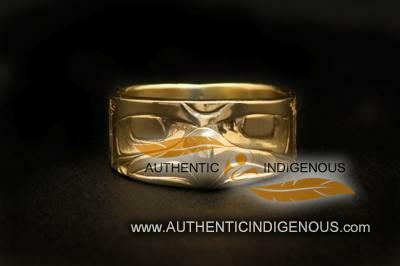 He is skilled in making fine quality jewellery in silver and gold ranging from rings, earrings, bracelets, necklace pendants to wood pendants. Darren has also carved many masks, paddles and fully finished drum designs. All of Darren’s work is hand carved. All the pieces are for sale, if he doesn’t have it in stock, he can customize another piece for you to your liking. Darren at times does set up a table of his art work at local art & craft fairs.